Candidates who have a disability or other health-related needs which might interfere with their ability to sit the test in the standard manner, should apply for reasonable adjustments online via their account as soon as possible after registration. All such requests must have been submitted by no later than 3 February 2019 at 5.15pm GMT. 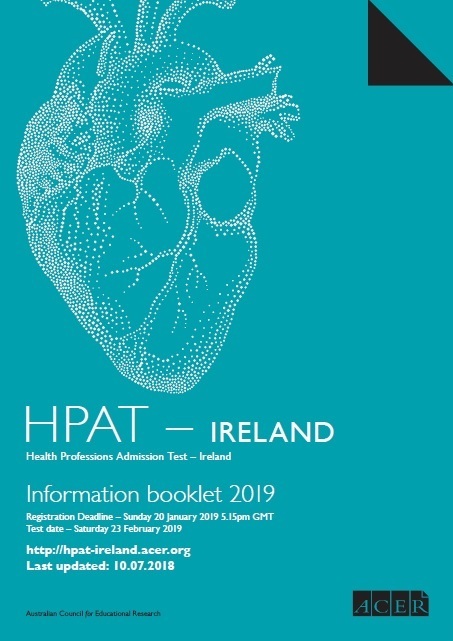 For conditions that occurred after the application deadline, please contact the HPAT - Ireland Office for advice. include the date and title, name, registration number, contact details, and signature of the medical practitioner. The documentation must be no more than one year old for health-related needs or disabilities other than learning disabilities, and no more than three years old for learning disabilities. Applicants with learning disabilities should submit a copy of an appropriate educational psychologist’s report for consideration. If the report is more than three years old, it will still be accepted as long as it is accompanied by a recent letter from a psychologist stating that the information in the report is still applicable to the candidate as they are today. All information regarding reasonable adjustments will be treated confidentially and will not be forwarded to universities or admission authorities. Invigilators on the test day will be informed to the adjustments provided to candidates, but not of their condition. Candidates who wish that invigilators be alerted of the nature of their condition should indicate this in the application process. All reasonable efforts will be made to provide appropriate testing conditions for candidates' needs. While there is no possibility of special consideration being given to test results or HPAT scores being adjusted to account for any perceived disadvantage, school leavers with a disability are advised to also apply under the Disability Access Route to Education (DARE) whilst mature applicants are advised to also apply under mature student access routes (details available on each university website). The Disability Access Route to Education (DARE) is a university admissions scheme which offers places on a reduced points/score basis (i.e. based on combined school leaving certificate and HPAT) to school leavers with disabilities. DARE has been set up by a number of colleges and universities as evidence shows that disability can have a negative effect on how well a student does at school and whether they go on to college. Each university taking part in the DARE scheme has allocated a limited number of places on their medical programmes on a reduced points basis for students entering through DARE. This number or quota is different for each university and RCSI. You can get details of the quotas on the website of each college and university that takes part in the DARE scheme. Find out more about the selection and admission policies on the websites of the participating universities.